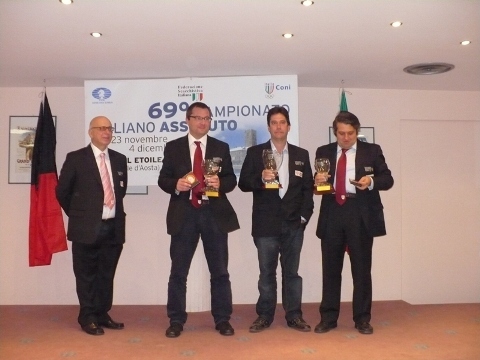 The 69th Italian Chess Championship was held from 23rd November to 4th December, in Sarre, Aosta Valley. Twelve players competed over eleven rounds of berger system for the title of Italian Champion and prize fund of 14.000 EUR. The exciting race between five-time champion GM Michele Godena and GM Lexy Ortega finishes with a shared first place after both had collected 7.5 points. 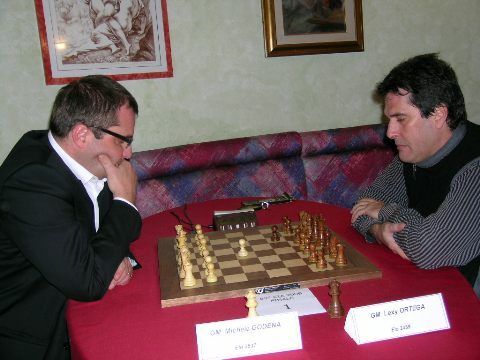 An additional rapid tiebreak (15 min + 5 sec per player) was required to determinate the 2009 Italian Champion. GM Lexy Ortega won 2-0 and claimed the trophy. Another tiebreak (round robin, 15 min + 5 sec time control) for the sole third place was played between IM Carlo D’Amore, IM Fabio Bruno and IM Denis Rombaldoni. Carlo D’Amore won and qualified directly for the next year championship. Andrea Stella and Denis Rombaldoni set the new record for the longest game played by Italians. Their 10th round match ended with the win by Rombaldoni after 180 moves and 8 hours and 20 minutes of play. Lexy Ortega was born in Camaguey, Cuba. The young Judo champion, he learned how to play chess after a broken foot incident (1974) which abruptly ended his martial arts career. Vey soon, he won the 1978 junior championship of Cuba. Ortega won more than 40 international tournaments and among his best results is the shared 3-4th place in Erevan 1986 in the field that included Tal, Romanishin, Psakhis, A.Petrosian and Balashov. Ortega also became a respected trainer, and coached Walter Arencibia in his run for the 1986 world junior championship. Later, he coached the Olympic Team of Mexico, the Olympic Team of San Marino, and most recently the Olympic Women Team of Italy in Dresden 2008. Ortega lives in Rome, Italy, since 1991, and he was awarded the Grandmaster title in 2000. He is married and has two children.